Haircut Menu, Broadway on Flickr – Photo Sharing!. 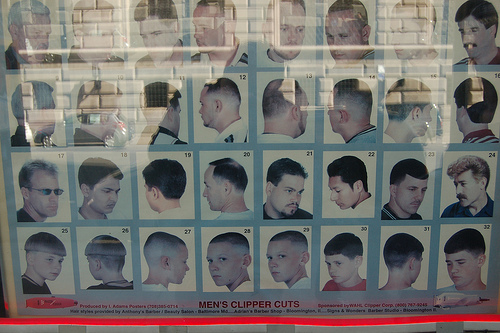 Spotted in the window of a barbers on Broadway (hence poor reflection and that). I’ll have a number 24 please. This entry was written by Jon Bounds, posted on 8 March 2010 at 2:30 am, filed under found stuff and tagged haircut, retro. Bookmark the permalink. Follow any comments here with the RSS feed for this post. Post a comment or leave a trackback: Trackback URL.